I've just started playing Star Wars: Knights of the Old Republic recently (I know I'm terribly slow, but that's how I play games nowadays. Wait until the price drops tremendously in Steam). While the graphics may look a bit dated (no surprises there), I'm quite enjoying the gameplay, which bears a close resemblance to Mass Effect and Dragon Age: Origins. Of course, with it being an open-world and story rich game, choices are sometimes quite hard to make during the game, where you are constantly updated on how much light vs dark points you've gained. Which is why I decided to write this post, where I attempt to document my journey throughout the game. Entries will be in reverse-chronological order. #3: Arrived in Dantooine and did all the stuff the council asked me to do, right up until the Star Forge. Decided to google a little bit more about Bastilla and unfortunately, ended up spoiling myself on who Darth Revan really is. The whole game suddenly seems a lot less fun now, since my character is stuck between the dark and light side. I would prefer to restart the game, but I think I will take a break from the game for the time being. 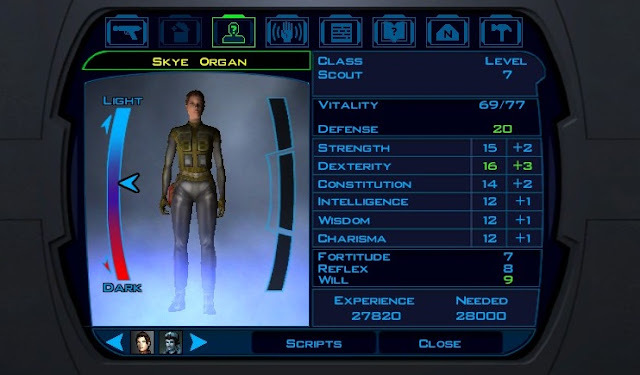 Maybe start playing another game to let this whole KOTOR thing cool off for a while. #2: I'm finally off the surface of Taris, but not without the Sith fleet bombing the entire planet to oblivion. A cumbersome task, I expect, with no Death Stars to help. No wonder the Empire wanted to build them so much, considering how they love destroying planets just for the sake of it. At the rate that they're going, I can't help but wonder if there will be any planets left in the end. I mean what's the point of Star Wars if there's no planets left to conquer. Of course, I managed to save Bastilla, the all so important Jedi prior to that, not to mention becoming a mini-celebrity by winning the Swoop race and becoming the ultimate dueling champion. Pity no one is going to remember that since the whole planet has been blasted to dust. On a side note, my force points are still hovering somewhere near the middle. Not sure how the Jedi Council will think of me now that I have to meet them but I hope I can end the game eventually without me really picking a side. Of course, upgrading force points would be a pain (I was wondering if I should have went with a scoundrel instead), but my plan is to bank on universal force powers. And maybe rely on my comrades a lot. Bastilla seemed to be okay, though sadly I can't romance her (yes I've read the forums). Curse you, pre-Mass Effect games. I guess I will instead awaken my inner Brokeback Mountain and try Carth instead, though he still seem to dstrust me a lot. And I'm not sure if my conversation options have been correct. I guess only time will tell. Until the next entry, speak to the Jedi Council, I must. #1: Day 2 since I started playing KOTOR. Created a new soldier character today and built it for melee combat, after realising in Taris that enemies normally rush you in apartments and my blasters weren't doing that much damage to enemies. Also, a dual blade wielding character is so much cooler than a blaster holding one. The new character was also created because I was unhappy with the previous light/dark side choices that I've made in the previous playthrough. I initially wanted a morally ambiguous character, one that is perhaps most similar to Han Solo. But in the previous playthrough, I stuck mostly to the light side because that's how I've been playing games for the past few years. The game also kinda forces you into either one of the spectrum, according to what I've heard online. I'm in Undercity right now and so far progress has been good. I helped Dia escape her bounty while killing Lagor for failing to pay his share. I'm still roughly in the middle of the spectrum, leaning a little to the dark, and I want to see how far I can make it in game by staying morally ambiguous, without consciously choosing either the dark or light side in all of my choices. Challenge accepted.